Discuss the inertial frame of reference. Discuss the non-inertial frame of reference. Describe the effects of the Coriolis force. What do taking off in a jet airplane, turning a corner in a car, riding a merry-go-round, and the circular motion of a tropical cyclone have in common? Each exhibits fictitious forces—unreal forces that arise from motion and may seem real, because the observer’s frame of reference is accelerating or rotating. When taking off in a jet, most people would agree it feels as if you are being pushed back into the seat as the airplane accelerates down the runway. Yet a physicist would say that you tend to remain stationary while the seat pushes forward on you, and there is no real force backward on you. An even more common experience occurs when you make a tight curve in your car—say, to the right. You feel as if you are thrown (that is, forced) toward the left relative to the car. Again, a physicist would say that you are going in a straight line but the car moves to the right, and there is no real force on you to the left. Recall Newton’s first law. Figure 1. 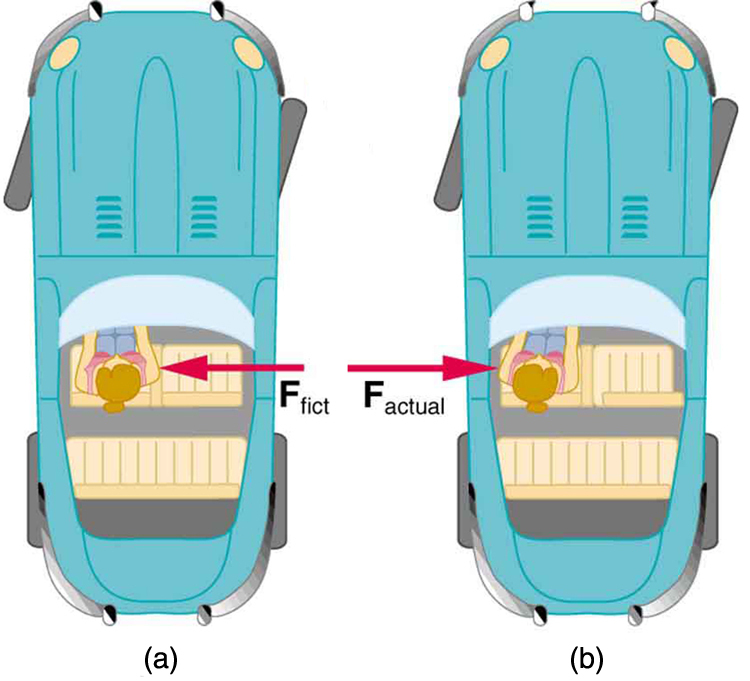 (a) The car driver feels herself forced to the left relative to the car when she makes a right turn. This is a fictitious force arising from the use of the car as a frame of reference. (b) In the Earth’s frame of reference, the driver moves in a straight line, obeying Newton’s first law, and the car moves to the right. There is no real force to the left on the driver relative to Earth. There is a real force to the right on the car to make it turn. We can reconcile these points of view by examining the frames of reference used. Let us concentrate on people in a car. Passengers instinctively use the car as a frame of reference, while a physicist uses Earth. The physicist chooses Earth because it is very nearly an inertial frame of reference—one in which all forces are real (that is, in which all forces have an identifiable physical origin). In such a frame of reference, Newton’s laws of motion take the form given in Chapter 4 Dynamics: Newton’s Laws of Motion The car is a non-inertial frame of reference because it is accelerated to the side. The force to the left sensed by car passengers is a fictitious force having no physical origin. There is nothing real pushing them left—the car, as well as the driver, is actually accelerating to the right. Let us now take a mental ride on a merry-go-round—specifically, a rapidly rotating playground merry-go-round. You take the merry-go-round to be your frame of reference because you rotate together. In that non-inertial frame, you feel a fictitious force, named centrifugal force (not to be confused with centripetal force), trying to throw you off. You must hang on tightly to counteract the centrifugal force. In Earth’s frame of reference, there is no force trying to throw you off. Rather you must hang on to make yourself go in a circle because otherwise you would go in a straight line, right off the merry-go-round. Figure 2. (a) A rider on a merry-go-round feels as if he is being thrown off. This fictitious force is called the centrifugal force—it explains the rider’s motion in the rotating frame of reference. (b) In an inertial frame of reference and according to Newton’s laws, it is his inertia that carries him off and not a real force (the unshaded rider has Fnet=0 and heads in a straight line). A real force, Fcentripetal, is needed to cause a circular path. 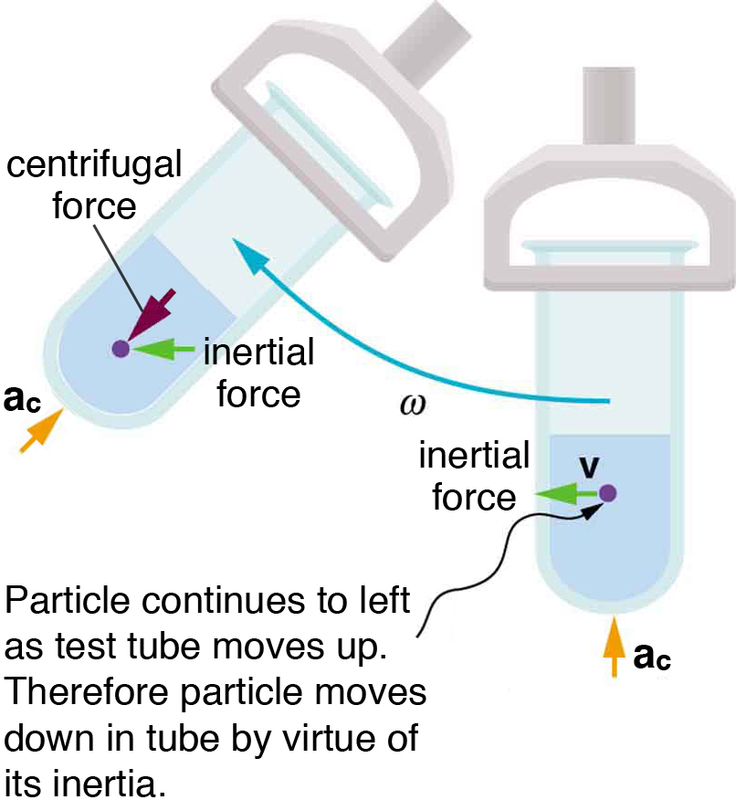 This inertial effect, carrying you away from the center of rotation if there is no centripetal force to cause circular motion, is put to good use in centrifuges (see Figure 3). A centrifuge spins a sample very rapidly, as mentioned earlier in this chapter. Viewed from the rotating frame of reference, the fictitious centrifugal force throws particles outward, hastening their sedimentation. The greater the angular velocity, the greater the centrifugal force. But what really happens is that the inertia of the particles carries them along a line tangent to the circle while the test tube is forced in a circular path by a centripetal force. Figure 3. Centrifuges use inertia to perform their task. Particles in the fluid sediment come out because their inertia carries them away from the center of rotation. The large angular velocity of the centrifuge quickens the sedimentation. Ultimately, the particles will come into contact with the test tube walls, which will then supply the centripetal force needed to make them move in a circle of constant radius. Let us now consider what happens if something moves in a frame of reference that rotates. For example, what if you slide a ball directly away from the center of the merry-go-round, as shown in Figure 4? The ball follows a straight path relative to Earth (assuming negligible friction) and a path curved to the right on the merry-go-round’s surface. A person standing next to the merry-go-round sees the ball moving straight and the merry-go-round rotating underneath it. In the merry-go-round’s frame of reference, we explain the apparent curve to the right by using a fictitious force, called the Coriolis force, that causes the ball to curve to the right. The fictitious Coriolis force can be used by anyone in that frame of reference to explain why objects follow curved paths and allows us to apply Newton’s Laws in non-inertial frames of reference. Figure 4. Looking down on the counterclockwise rotation of a merry-go-round, we see that a ball slid straight toward the edge follows a path curved to the right. The person slides the ball toward point B, starting at point A. Both points rotate to the shaded positions (A’ and B’) shown in the time that the ball follows the curved path in the rotating frame and a straight path in Earth’s frame. Up until now, we have considered Earth to be an inertial frame of reference with little or no worry about effects due to its rotation. Yet such effects do exist—in the rotation of weather systems, for example. 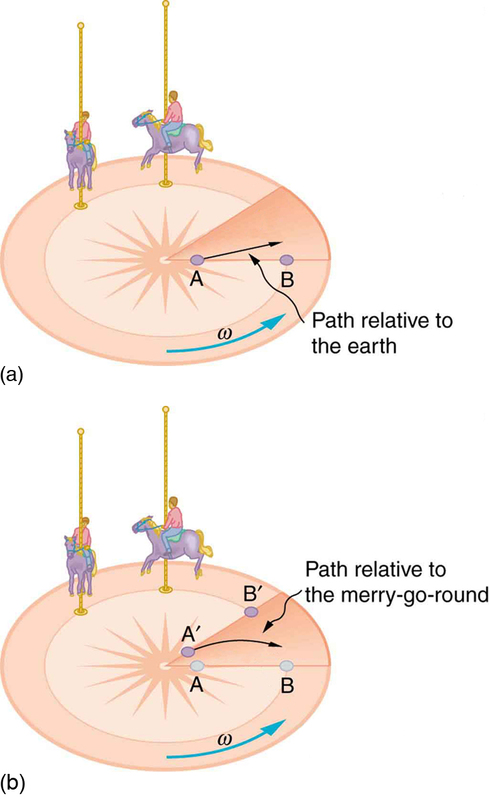 Most consequences of Earth’s rotation can be qualitatively understood by analogy with the merry-go-round. Viewed from above the North Pole, Earth rotates counterclockwise, as does the merry-go-round in Figure 4. As on the merry-go-round, any motion in Earth’s northern hemisphere experiences a Coriolis force to the right. Just the opposite occurs in the southern hemisphere; there, the force is to the left. Because Earth’s angular velocity is small, the Coriolis force is usually negligible, but for large-scale motions, such as wind patterns, it has substantial effects. 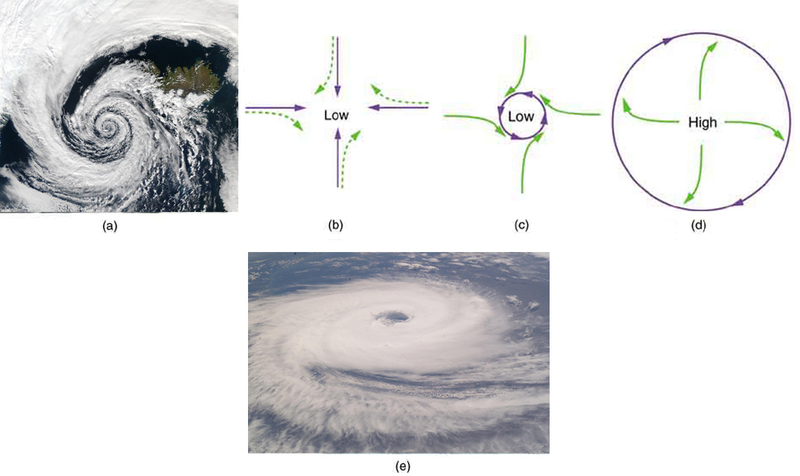 The Coriolis force causes hurricanes in the northern hemisphere to rotate in the counterclockwise direction, while the tropical cyclones (what hurricanes are called below the equator) in the southern hemisphere rotate in the clockwise direction. The terms hurricane, typhoon, and tropical storm are regionally-specific names for tropical cyclones, storm systems characterized by low pressure centers, strong winds, and heavy rains. Figure 5 helps show how these rotations take place. Air flows toward any region of low pressure, and tropical cyclones contain particularly low pressures. Thus winds flow toward the center of a tropical cyclone or a low-pressure weather system at the surface. In the northern hemisphere, these inward winds are deflected to the right, as shown in the figure, producing a counterclockwise circulation at the surface for low-pressure zones of any type. Low pressure at the surface is associated with rising air, which also produces cooling and cloud formation, making low-pressure patterns quite visible from space. Conversely, wind circulation around high-pressure zones is clockwise in the northern hemisphere but is less visible because high pressure is associated with sinking air, producing clear skies. The rotation of tropical cyclones and the path of a ball on a merry-go-round can just as well be explained by inertia and the rotation of the system underneath. When non-inertial frames are used, fictitious forces, such as the Coriolis force, must be invented to explain the curved path. There is no identifiable physical source for these fictitious forces. In an inertial frame, inertia explains the path, and no force is found to be without an identifiable source. Either view allows us to describe nature, but a view in an inertial frame is the simplest and truest, in the sense that all forces have real origins and explanations. Rotating and accelerated frames of reference are non-inertial. Fictitious forces, such as the Coriolis force, are needed to explain motion in such frames. 1: When a toilet is flushed or a sink is drained, the water (and other material) begins to rotate about the drain on the way down. Assuming no initial rotation and a flow initially directly straight toward the drain, explain what causes the rotation and which direction it has in the northern hemisphere. (Note that this is a small effect and in most toilets the rotation is caused by directional water jets.) Would the direction of rotation reverse if water were forced up the drain? 2: Is there a real force that throws water from clothes during the spin cycle of a washing machine? Explain how the water is removed. 3: In one amusement park ride, riders enter a large vertical barrel and stand against the wall on its horizontal floor. The barrel is spun up and the floor drops away. Riders feel as if they are pinned to the wall by a force something like the gravitational force. This is a fictitious force sensed and used by the riders to explain events in the rotating frame of reference of the barrel. Explain in an inertial frame of reference (Earth is nearly one) what pins the riders to the wall, and identify all of the real forces acting on them. 4: Action at a distance, such as is the case for gravity, was once thought to be illogical and therefore untrue. What is the ultimate determinant of the truth in physics, and why was this action ultimately accepted? 5: Two friends are having a conversation. Anna says a satellite in orbit is in freefall because the satellite keeps falling toward Earth. Tom says a satellite in orbit is not in freefall because the acceleration due to gravity is not 9.80 Who do you agree with and why? 6: A non-rotating frame of reference placed at the center of the Sun is very nearly an inertial one. Why is it not exactly an inertial frame? 6.4 Fictitious Forces and Non-inertial Frames: The Coriolis Force by OpenStax is licensed under a Creative Commons Attribution 4.0 International License, except where otherwise noted.